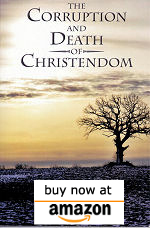 This book shows the ruin of the professing church in its testimony for God in the earth and world. Christendom has failed in its corporate responsibilities, and the truth of this reality is clearly taught by the Spirit of God in Scripture. This work puts the testimony of Scripture together for the believer to understand this important reality as it exists in the kingdom of heaven, and as we approach the end of the age. Jezebel in Thyatria is corruption. God gathers His faithful remnant: Philadelphia. The corporate body is spewed out of His mouth. The candlestick is removed. “He who has an ear, let him hear what the Spirit says to the churches” (Rev 2:7). Chapter 13 – The Babylonian Harlot: Christianity or Islam? Chapter 19 – What in the World are we to do?